Baxter! is a 1973 British drama film directed by Lionel Jeffries and starring Patricia Neal, Jean-Pierre Cassel and Britt Ekland. A young boy struggles to overcome his speech problem and strained relationship with his parents. The film was based on a book by Kin Platt, called The Boy Who Could Make Himself Disappear. The film was made before Jeffries' third film as director, Mr Amazing Mr Blunden, but released afterwards. The Boy Who Could Make Himself Disappear was published in 1968. One critic called it "unforgettable". 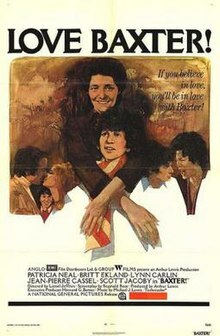 The film starred Scott Jacoby, who had just played the lead in a TV movie, That Certain Summer. It was a rare English language film for Jean-Pierre Cassel. ^ "Baxter! (1972)". Ftvdb.bfi.org.uk. Retrieved 25 October 2017. ^ BAXTER! Monthly Film Bulletin; London Vol. 40, Iss. 468, (Jan 1, 1973): 48. ^ Review 3 -- No Title Coles, Robert. Chicago Tribune 6 Oct 1968: p20. ^ Would-be Lawyer Tuning Up as Actor Haber, Joyce. Los Angeles Times (1923-Current File); Los Angeles, Calif. [Los Angeles, Calif]13 Mar 1973: e9. ^ Cassel on Tour: Of Cassel and 'Baxter!' By Michael Kernan. The Washington Post, Times Herald 10 Mar 1973: B1. This article related to a British film of the 1970s is a stub. You can help Wikipedia by expanding it. This page was last edited on 7 February 2019, at 15:40 (UTC).